Weeping Water News Drops was a newsletter published by the men at Camp 25 from August 8, 1942 through April 1943. 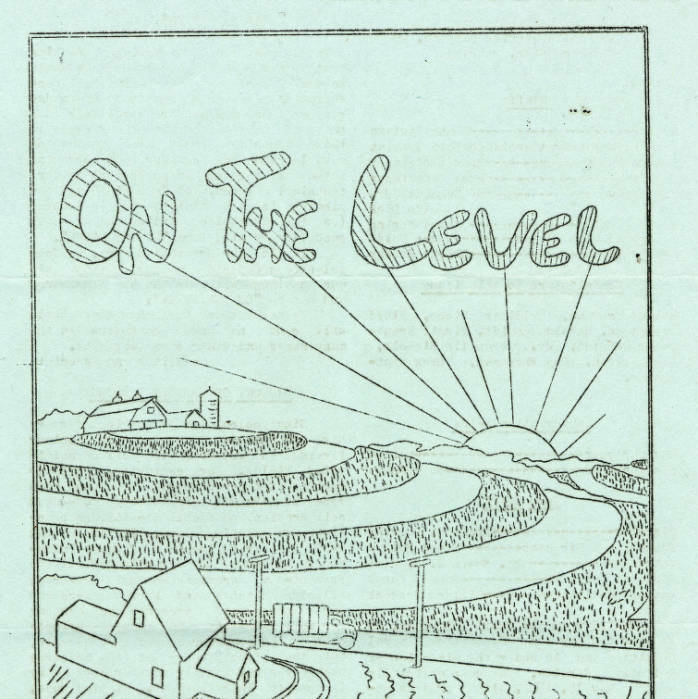 On The Level was a newsletter published by the men at Camp 25 from February to April 1943. 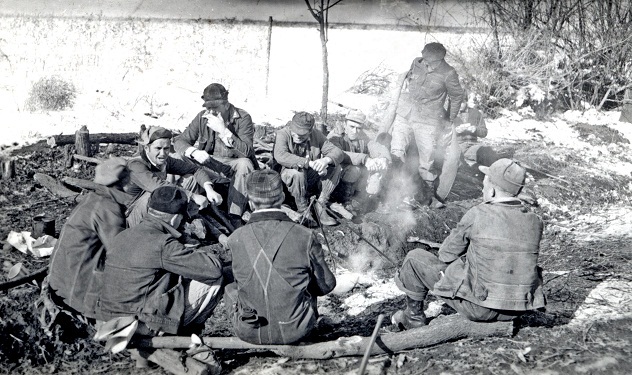 Men talking around an outdoor fire at Camp 25, Weeping Water, Nebraska. Coming in for mealtime at Camp 25, Weeping Water, Nebraska. Daily work at Camp 25, Weeping Water, Nebraska. CPS Camp No. 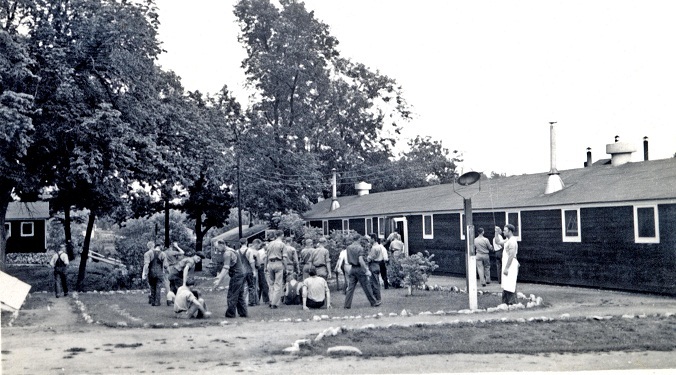 25, a Soil Conservation Service base camp located on the southeast edge of Weeping Water, Nebraska and operated by the Mennonite Central Committee, opened in April 1942 and closed in April 1943. 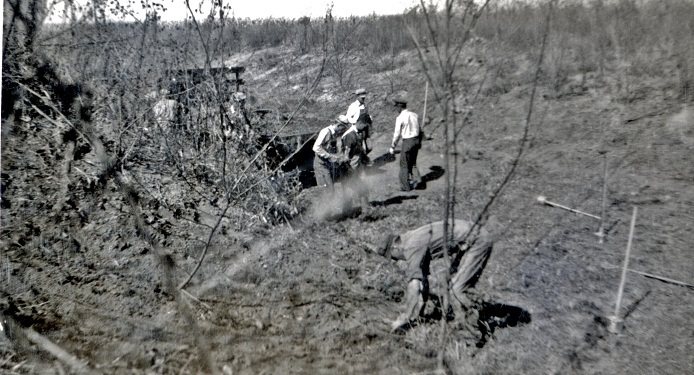 Men fenced pastures, planted trees, tiled drainage ditches, surveyed for contour farming and performed related duties. CPS Camp No. 25, a Soil Conservation Service base camp, was located on the southeast edge of Weeping Water, Nebraska, found thirty-five miles south of Omaha and thirty-five miles east of Lincoln. As in other Mennonite CPS camps, most of the men reported Mennonite denominational affiliations when entering CPS. Men fenced pastures, planted trees, tiled drainage ditches, surveyed for contour farming and performed related duties. During this period a tornado devastated an area eight miles from the camp and the men gave emergency aid in clearing debris. Roland H. Kaufman, drafted from his teaching position in Olsburg, Kansas reported to the camp in June 1942. With the men in camp sharing religious and other experiences, and with camp leaders working to keep unity and harmony, camp life tended to be relatively calm in comparison with camps of far greater diversity among the CPS men. In general Mennonite men tended to respect authority. At Weeping Water, the men liked to hook rugs. This particular form of recreational activity was popular in many camps. The men published a camp paper Weeping Water News Drops from August 8, 1942 through April 1943. They also published On the Level during February – April in 1943. For more information on soil conservation camps see Melvin Gingerich, Service for Peace: A History of Mennonite Civilian Public Service. Akron, PA: Mennonite Central Committee printed by Herald Press, Scottdale, PA 1949, Chapter X pp. 108-124.